Beginnings are important. Barbara Kingsolver once said, “A beginning is a promise to your reader.” While she was speaking about books, the same can be said about launching writing workshop. My first writing unit is a promise to the writers in my class. Poetry is the perfect place to start. Poems are wonderful as a launching point for our writing because students can write many poems in a unit and feel like prolific writers from the start. 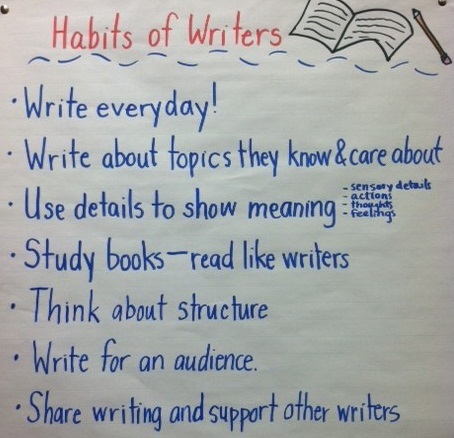 They can learn the habits of mind of writers and the routines of writing workshop while crafting meaningful pieces using a balance of different details and thoughtful structure. Bend 1: What do writers write about? Immersion: We start by reading lots and lots of poems. We let the wondrous words of Eve Merriam and Valerie Worth wash over us. We let the rhythm and humor of Jack Prelutsky and Shel Silverstein bounce around in our brains. I share the advice to aspiring writers from U.S. Poet Laureate, Ted Kooser, who said, “Read as much as you can. Read fifty or a hundred poems by others for every one you try to write of your own.” I scatter stacks of poetry anthologies and favorite poems on each table. Soon the hum of students sharing poems with their friends fills the room. The energy for writing builds. Bend 2: What details do writers use? 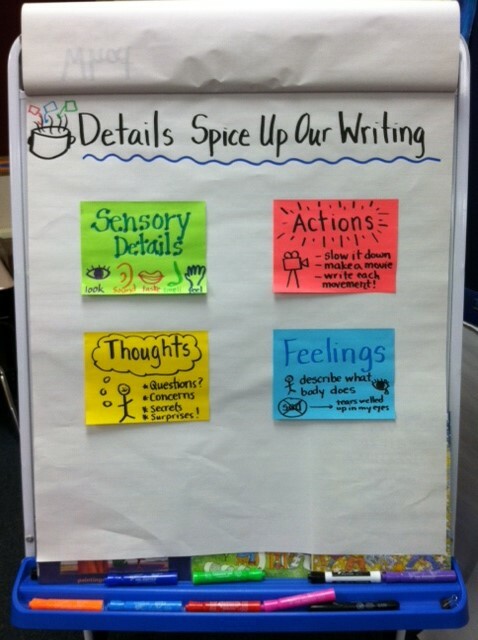 Planning and Drafting: We spend this week focusing in on kinds of details that poetry writers (and all writers) use. Each day we learn about another kind of detail using digital and print mentor texts. Sensory Details: We read the Black Book of Colors by Menena Cottin, which describes colors through the eyes of a blind person, using vivid sensory details that paint a picture in the reader’s mind. Students write color poems, inspired by the author’s work. Action: To help students throw out boring actions like, “The cheetah runs,” I show a slow motion video from National Geographic of a cheetah running. I teach my students that while we don’t always have slow motion cameras, we can make movies in our minds of actions and slow them down, describing them step-by-step. We describe every little movement of the cheetah, cut extra words, and organize the ideas into a poem. Students then use their favorite activities and write a poem about them, slowing down the actions in their minds as they write. Thoughts: We read Shel Silverstein’s “Whatif” poem and mine our notebooks for important events from our life where thoughts filled our head. I model with the topic of riding a bike and have the students help me list actions and thoughts they experienced when they rode a bike for the first time. We move around lines, cut irrelevant words, and craft a poem from that experience. Feelings: We pick a feeling and act it out as a class. I choose different feelings depending on the class: embarrassed, excited, devastated, etc. We work as a class to describe all the things our bodies do when we’re feeling that way. Then we take that list of ideas, move lines around, and craft a poem. Bend 3: How can I structure my poem to reveal meaning? Revising: We focus on revising for mood and meaning. Students reread their poems and ask: What am I really trying to say about this topic? Do all my lines fit? We reach for the truest words. Editing: We study the purpose of line breaks and the choices favorite poets have made. We try out different line breaks in our poems by cutting up our poems and moving the lines around. We also look at stanzas, noticing when to use them, and we revise our poems. Publishing: We present our finished poems for the world to see. Sometimes, we create a class anthology of our favorite poems. This year, we published our poems online using Kid Blog and invited families and friends to read our work. At the end of the launch, we share our poems aloud and finish our celebration with a Martinelli’s toast. We thank everyone who helped us–friends, poets, teachers, topics, details, and family. My class finished our poetry launch unit last week. As we gathered around the carpet to toast each other and our poems, you could feel the anticipation and buzz for the year of writing ahead. I’m excited for the writing to come and the promise the class holds. How did you launch writing in your classroom this year? Jenny Maehara is a 4th grade teacher, literacy teacher leader, and professional developer in the SF Bay Area. 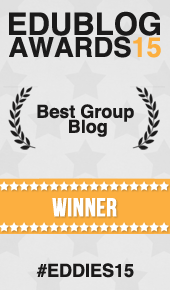 She writes alongside two fourth grade classes at http://kidblog.com/room19writes and http://kidblog.com/room13writes. You can find her blogging about teaching at Raising Voices and tweeting @jennymae. What a beautiful post….I am pinning and sharing. Thank you. – a. Thanks, Amy! Glad you enjoyed it. I really like the idea of looking at the works of great poets to help students determine what makes a great poem as opposed to simply telling them or handing them a rubric. The post mentions looking at the writing habits of the poets. If I were to do this unit, we would also take a brief look at the idiosyncratic characteristics of the different poets, if they drafted, if they tended to write about what they were seeing at the time, if they wrote poems at specific people,etc. Absolutely. I try to hone in on a few styles of certain poets, such as Valerie Worth who often writes about objects and helps the reader see them in a new light. You and your students should participate in Chalk-A-Bration this month. It is a celebration of poetry and chalk combined. Check it out at http://teachingyoungwriters.blogspot.com It would be great to have you. I loved the “details” visual. So often we tell students to “add detail” without showing them how. Great ideas and text resources. Love the idea! Chalk-A-Bration sounds like a lot of fun! I’ve been tweaking my details chart over the years. I’m getting excited to add “dialogue” to it during our narrative unit! 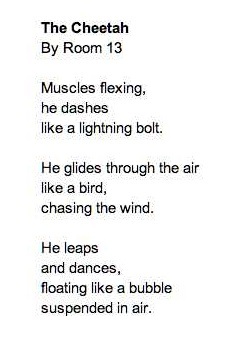 I read your kidblog and loved the poetry: a very inspirational way to start the year! Thanks for sharing your thinking. Thanks so much, Julieanne! 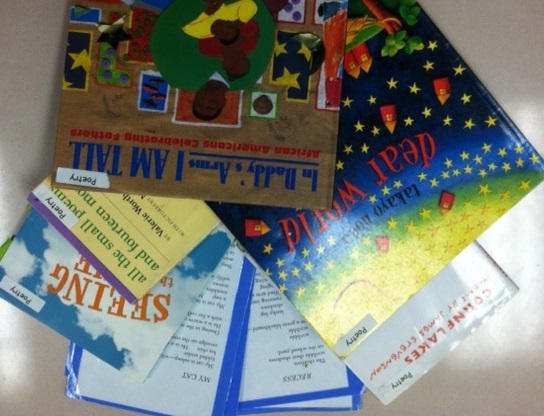 I really enjoyed launching with poetry–they’re so much fun to read and use as a mentor text! I love the Barbara Kingsolver quote. You are so right that the beginning is a promise- and the first unit of the year is so, so important for setting the tone and helping students imagine the kind of writers they want to be this year. Pushing kids toward meaning early on sets a tone that their ideas matter. Great post! Thanks, Anna! The Barbara Kingsolver quote is one of my favorites too. She shared it at an author event a few years back when she was promoting The Lacuna. I quickly jotted down the quote and have been sharing it with others ever since. Launching with poetry went event better than I expected–I’m seeing tracks of my teaching in their narrative quick writes before our new unit has even started!